Des Peres homeowners collaborate with their dream team to create their contemporary vision. Rounded elements such as the ceiling and buffet pieces define the dining room. Square cut outs in the custom maple door let in natural light while a square insert mixes in a pop of copper. A Robert Kelly painting, "Shebia Ruz XVII," watches over two sage green Mousson chairs by Holly Hunt. The barrel ceilling, painted in rich clay by West Park Painting, enriches the hearth room. The ideal space when entertaining, the kitchen's island can seat additional guests, be set as a serving station or function as a prep area. Serene blues, purples and grays make this master suite a retreat. Bringing nature in, a curved wall of windows gives a picturesque view of the backyard and pool. After stumbling upon the empty lot on the market by Johnson Development, the homeowners immediately began discussing ideas with Roger and Bill, who have worked together for nearly 30 years. Knowing they wanted a contemporary home, they approached Roger to see if their ideas were something he could build. Even with Barbara out of state, the project came together quickly. As ideas and plans formed, the team threw out the traditional notions of how a home functions and opened the door to the unexpected. Approaching the front of the home, one can immediately see that while classic, this home isn’t your typical build. Oversized unusual bricks blanket the exterior of the home while a Brazilian slate tile walkway leads you to the front door. Opening the door, you immediately feel the Frank Lloyd Wright influence. Natural and organic, the interior of the home is unified with the outdoor landscape forming an interrelated composition. 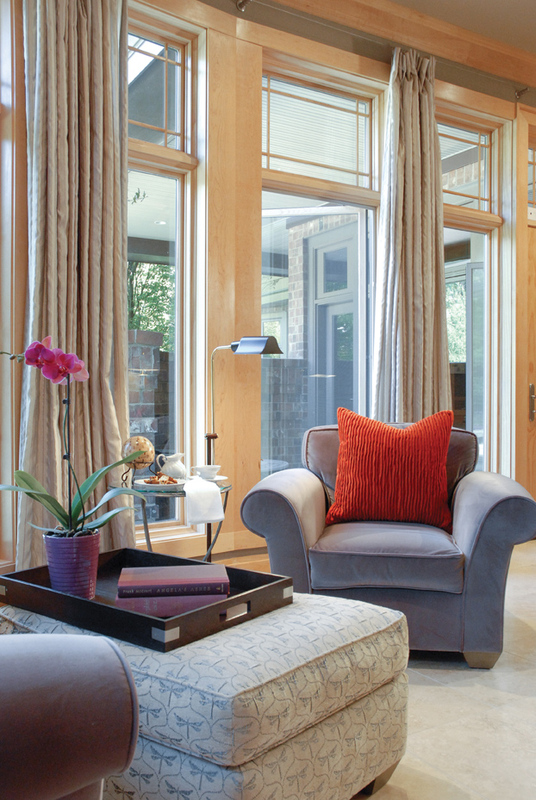 Elegant yet comfortable while warm and inviting, the homeowners sought an easy flow between rooms with an open approach. To achieve the open look while still creating a cozy home, architect Bill Cover blurred the lines between rooms with furniture pieces, not walls. “We deviated from traditional notions of doors and walls and came up with a creative solution,” Bill says. The brightest example can be seen upon entering the home. An inviting dining room cove is set apart from the entry and great room with two rounded buffets. Topped with sculptural pieces by Daryls Ewoldt, the buffets serve multiple purposes. Not only do they define the space, they also provide additional storage and are great for serving while entertaining, which the homeowners do often. 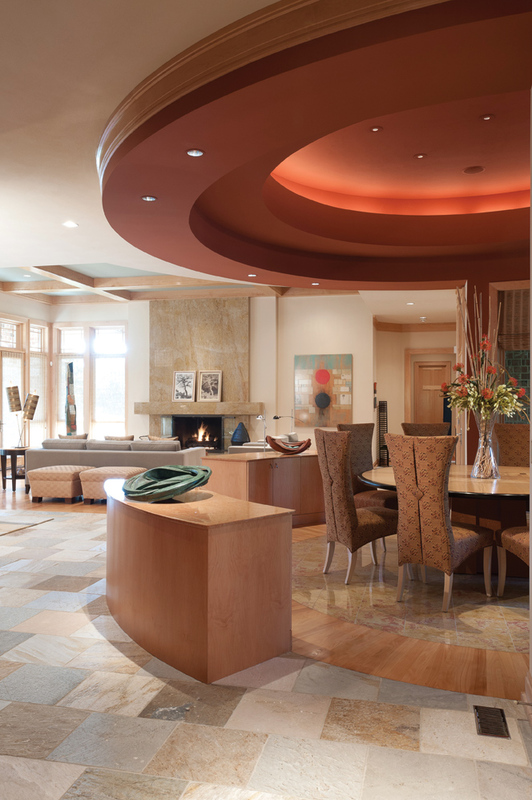 The round, lighted cove ceiling further defines the dining space. The curved wall of windows in the dining room overlooks the lush landscaped backyard and pool area. An oversized round dining table seats ten and creates a cozy feeling in the space. “The round table builds camaraderie and conversation,” the homeowner says. When not dining around the round table, the homeowners’ family, friends and guests hang out in the conjoined kitchen and hearth room. Just off the dining room, the space provides the ideal view into the serene backyard. 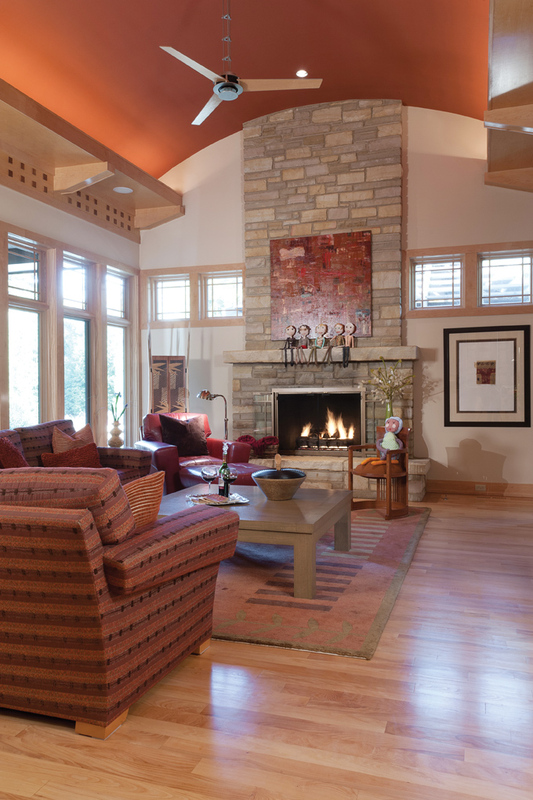 A barrel ceiling painted in rich clay keeps the hearth room from feeling too expansive. A custom wood light rail with mahogany details brings the ceiling down while warming the space. A fiery toned canvas, “Abstraction,” by Jeffrey Keith joins a family of handmade fiber dolls, created by the homeowners’ daughter, to liven the floor-to-ceiling fireplace. The red tones of the painting carry down to the Dakota Jackson boxer sofa and love seat in Donghia fabric. An additional fiber doll sits cozily in a Frank Lloyd Wright-inspired barrel chair by Boyd & Dreith. Across from the wall of windows a custom-built wood entertainment piece doubles as a divide between the hearth room and the laundry area. Sharing the open space with the hearth room is the kitchen and breakfast nook. A custom and colorful dining table from Axi Furniture is a picturesque spot for dining. With a direct view to the patio and pool, natural light pours into the space. 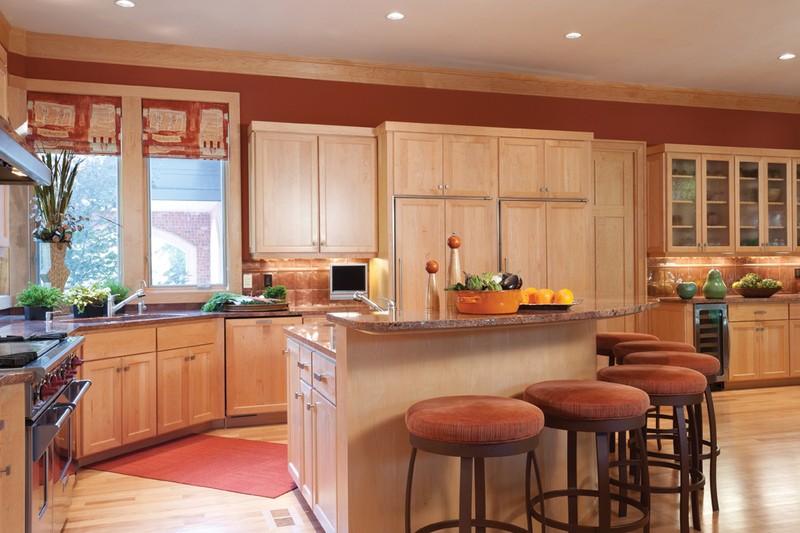 In the kitchen, light maple cabinets and trim pop against the burnt orange walls, while a large, Bordeaux granite-topped island is ideal for food preparation or seating guests. When designing their home, the homeowners knew the kitchen had to be great for entertaining. “Everyone hangs in the kitchen, so we made sure it was big enough to accommodate,” the homeowner says. The copper backsplash creates texture when paired against the maple cabinetry. 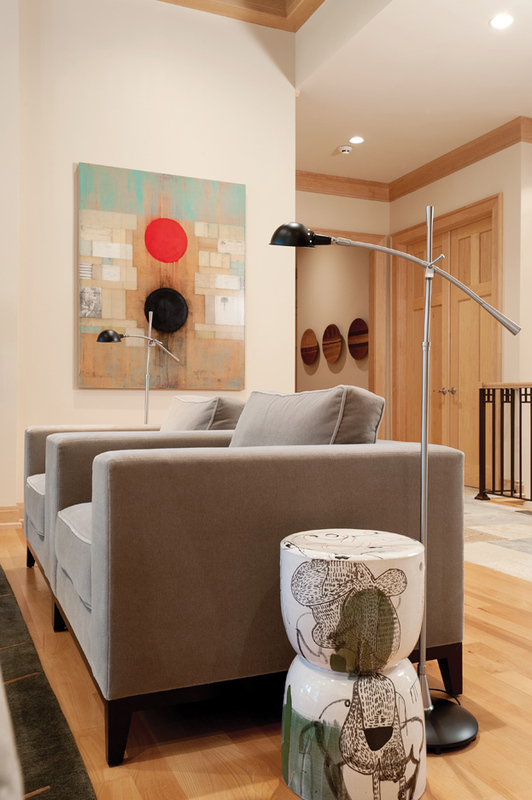 Much of the homeowners’ artwork and furnishings come from Colorado and Sante Fe, two places Barbara has a close connection with. To ensure the project stayed on schedule, Barbara would preview the furnishings being built outside the St. Louis area to prevent any glitches. In working with her clients on previous projects, she knew their style and what they liked. 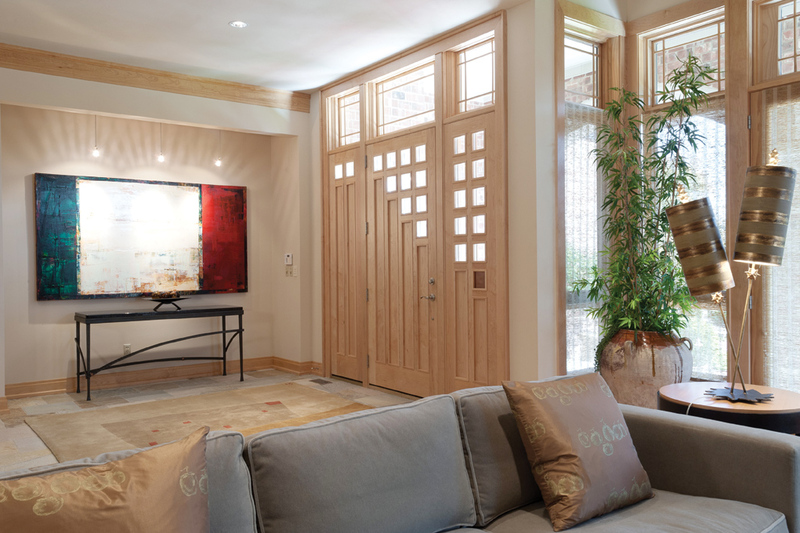 Custom designed rugs by Joan Weissman warm the floors throughout the home, including the entryway. Barbara was able to visit Weissman’s studio in Santa Fe and work directly with her to design each rug. Opposite the entry is the home’s great room. Sage green mousson sofa and chairs in mohair fabric by Holly Hunt are the ideal place to curl up in front of the fire. But it is a colorful painting to the side of the marble fireplace that draws the eye. With its bold punches of red and black, the commissioned piece by Robert Kelly, “Shebia Ruz XXXVIII,” is a favorite of both the homeowners and the designer. “We loved the color and detail in the painting,” the homeowners say. “Barbara was able to have it produced in the size we need for the space." Following the extra wide hallway from the great room leads past a quaint guest room to the master suite. “The extra width we added to the hallways keeps the space feeling contemporary,” Cover says. Serene tones of blues, purples and grays in the master are accented with bold pops of burnt orange. A large ottoman covered in dragon fly fabric sits between two Donghia mohair chairs. The seating area, placed against the curved wall windows, provides the perfect view, blurring the line between indoors and out.